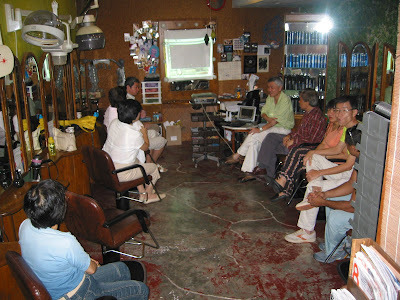 We re-visited our discussions about Environment and Demographics in the Year 2008. Someone asked, "Biodiversity - what is it?" Is it where there is many types of biological species co-existing? Tanjong Sutera, an eco-resort, is now surrounded by vast oil palm plantations. There are only a few companies owning the plantations and they have recently merged to become yet bigger and therefore more capable of buying more tracks of forested land for their crop. Palm oil is a valuable commodity and now they are even used to make biodiesel. There is little the common man can do to stop oil palm plantations encrouching into forested land. I think it will very difficult to persuade plantation owners not to continually expand. I think in order to stop the environmental encrouchment, the alternative must be more attractive to them. Joo Hock reiterated that Bucky said that for a new system to replace the old one, the former must be a more attractive and valuable option. In this context, crops like japrotha that grows in sub-tropical arid lands and can be used as biofuels should be encourage in a massive scale. Perhaps when they are grown in abundance, then prices of oil palm will be moderated and make it unattractive for the plantations to expand. There are also alternative renewable energies will change the equation, for instance, solar panels are expected to go through leaps of efficiency gains in the next few years from its present efficiency rate of 10%. Panels at 42% efficiency are already achieved in R&D laboratories. We discussed about vehicle carbon dioxide emissions and how at the traffic lights, Bucky likened that to the time of horse carriages where all the horses are running on the spot and wasting all their energies. This problem will be eliminated with the use of electric vehicles. I often see bus drivers and taxi drivers keeping their engines on idle and spewing out smoke, as they sit inside resting or sleeping. I feel that we should be more courageous to stop these irresponsible acts. We can also take down their location, time and number plates, and report them to the National Environmental Agency (Singapore), who will take the appropriate action. I was told they could fine them. There are lots of new and effective technologies out there that can serve to clean up our enviroment. Some of them are relatively inexpensive too. What is lacking are financing and the political will (read patience) to implement these technologies. We will need an extra 250 million females in India and China, as both countries still practise female infanticide. The "Asian Switzerland" will be Singapore. As we speak, China is now thinking of ways to abolish the one-child policy gradually, as they recognise that they will have a huge grey population and not enough young people to take care of them. People are also living longer. Is it necessary to increase younger population? I think old people can be educated to stay healthy and independent to reduce the reliance on their young; and also proper building and transport design and technology should help them further. Question: Is there any point of living a longer life when there is no quality of life in a developing country? For that, one of us supports euthansia and legalisation of suicides. I wondered aloud if the pollution of the waterways with oestrogen has caused the suspected increase in the number of gays. [I mentioned the recent article in the Economist magazine, where oestrogen from contraception pills have found their way to the sewage system and then to lakes where male fishes have turned female. They stopped producing sperms and instead have eggs. Read another article here. Immediately, I got an outrage from someone who claims that it could be that more gays are now 'coming out'. That there are gays since the dawn of mankind; that there is homosexuality in the animal kingdom and there are gays in dolphins and whales...etc. (Is that the humpback whale? oops!) Is this nature's way of limiting the world population, as gay couples cannot reproduce between themselves?